Visconti has seen many successes in their Demonstrator pens from the launch of the Van Gogh Clear in 2002, to the Opera Master demonstrator revealing the double reservoir filling system to the world for the first time. We are thrilled to introduce the latest demonstrator pen, the Visconti Silver Dust. The Silver Dust Collection takes its inspiration from cosmic dust. Cosmic dust is a type of particle created from tiny crystals released from stars. It is formed when a star, like the sun, sends out atoms. In August 2014, scientists announced the collection of possible interstellar dust particles from the Stardust spacecraft after its return to Earth in 2006. Since studying the particles, scientists have found that cosmic dust exsists all over the planet and enters Earth’s atmosphere every day. Visconti has decided to celebrate this historical event with the launch of this exquisite special edition pen. 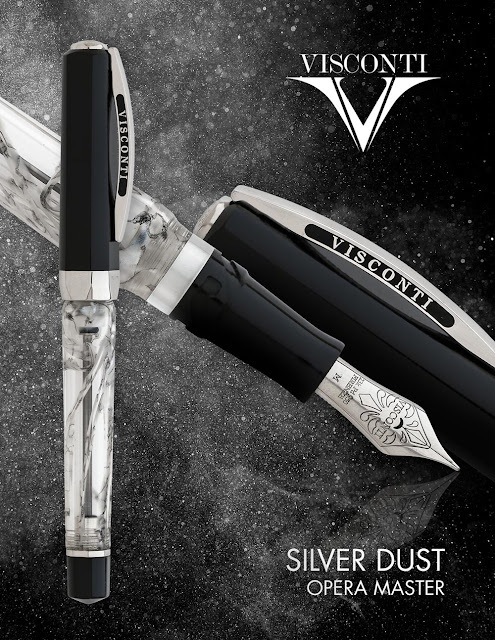 The Visconti Silver Dust is a limited edition writing instrument with only 600 pieces crafted and released worldwide. It is based on the iconic Opera body, featuring the squared circle form, a combination of a square and a circle, to create the perfect ergonomic shape for a writing implement. It has a clear body in acrylic resin with particles that recall the silver cosmic dust. The cap is made from a solid block of specially selected Lucite resin made to fit the high-quality standards of Visconti in both strength and brightness. The heart of this collection lies within the body of the pen. The result is a completely translucent body swirled with particles that recall the silver cosmic dust. The famous double reservoir filling system can be seen amid the swirls, and the pen features a tubular chromium nib. The pen features Visconti's flexible 23kt palladium Dreamtouch nib, available in EF, F, M, B and Stub widths and fills with Visconti's high vacuum double reservoir power filler. The pen's lock system, a Visconti patent, is the well-known Hook Safe Lock method that allows the user to close the pen by rotating it by only 20°, thus making it almost impossible to open the cap by accident. All trims are palladium plated and the pen will be packaged in Visconti's new look 2018 luxury box. MSRP is $1,095 and is limited to 600 pieces world-wide. The first shipment is expected to arrive in the US in February, 2018. Call 1-888-747-7367 or email us at support@ipenstore.com for availability.